Hollande has reacted furiously to the allegation but did not deny it. 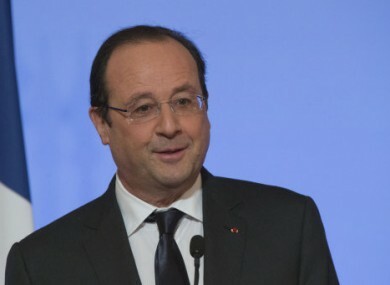 French President Francois Hollande during a New Year speech at the Elysee Palace in Paris. A FRENCH MAGAZINE that revealed an alleged affair between President Francois Hollande and actress Julie Gayet said this evening it would remove the report from its website at her request. “Julie Gayet’s lawyer contacted us to request we remove from the website all mention of this relationship,” Laurence Pieau, editor of Closer, told AFP. Hollande has reacted furiously to the allegation, which were backed up by photos reportedly showing the 59-year-old president entering Gayet’s flat, but did not deny it, threatening legal action over what he called an attack on his right to privacy. “It’s a real passion that has… turned their lives upside down and makes them take insane risks,” Closer said in a special edition detailing the 59-year-old president’s alleged infidelity. The seven-page spread printed photos of Gayet, 41, arriving at a flat in an upmarket part of Paris on 30 December, not far from the Elysee palace where Hollande lives. Half-an-hour later, a man whom it identifies as Hollande’s bodyguard inspects the hallway of the apartment block before the arrival of a scooter with two helmeted men on board, one of whom they say is Hollande although his face is concealed under a helmet. The bodyguard, however, does show his face and is identified as part of Hollande’s official security detail. The next morning, according to Closer, the bodyguard delivers croissants to the couple, and three hours later, a helmeted man is pictured mounting a chauffeur-driven scooter and driving off. Gayet later leaves the flat too. In a statement to AFP, Hollande slammed the report as an attack on the right to privacy, to which he “like every other citizen has a right”. He said he was “looking into possible action, including legal action” against the weekly magazine. But he did not deny the allegations. Hollande officially lives with his partner Valerie Trierweiler, a journalist for whom he left fellow Socialist politician Segolene Royal, the mother of his four children. But the two are not married, and Trierweiler, whom Hollande described as “the love of my life” in 2010, is referred to in American media as “the first girlfriend”. Gayet is an established television and film actress, and also appeared in one of Hollande’s 2012 election campaign commercials, describing the then presidential candidate as “marvellous” and “humble and a really good listener”. She most recently had a role of diplomatic official in “Quai d’Orsay”, a French movie that parodies the inner workings of the French foreign ministry. Rumours the two were having an affair had until now stayed under the radar, with the mother-of-two — who is separated from her husband, Argentinian filmmaker Santiago Amigorena — filing a legal complaint in March over the speculation. In December, though, French actor Stephane Guillon made innuendos on the subject during a talk show where he and Gayet were promoting a film in which they co-star. The alleged liaison comes at a time of deep unpopularity for Hollande, accused of being inefficient at a time of sky-high unemployment and general economic malaise in France. A poll published Thursday showed that only 25 per cent of those questioned said they trusted Hollande, who has become the most unpopular president in post-war France. If confirmed, the relationship would perpetuate a long French tradition of philandering presidents. Former president Jacques Chirac is believed to have had many extra-marital conquests, as did his predecessor Francois Mitterrand, who even had a daughter born to a mistress. But much of this has been swept under the carpet as France’s media is subject to strict laws on invasion of privacy, which can be punished with a year’s jail and a fine of 45,000 euros ($61,000). Closer editor Laurence Pieau told AFP that the magazine had been ordered by Gayet’s lawyer to remove all reference to the alleged relationship from its website, hinting at privacy issues. Nevertheless, experts said the magazine’s revelations were unprecedented. “A few years ago, they would never have gone ahead with this. We’re moving away from the French tradition of respecting private life and we’re going towards the Anglo-Saxon system,” said Delphine Meillet, a lawyer specialised in media law. Email “French magazine alleges Francois Hollande affair with actress”. Feedback on “French magazine alleges Francois Hollande affair with actress”.